Df31 (Decondensation factor 31) plays a role as RNP complex in the decondensation of Drosophila chromatin. We used the MicroScale Thermophoresis to study details of this epigenetic player and its network (see Literature). After detecting Df31 only at chromatin containing RNA, but not at chromatin depleted of RNA, MST was used to show that the protein is able to bind to random ssRNA, but not to ssDNA of same sequence (left panel). In the next step, MST helped to confirm, that snoRNAs enriched at open chromatin, specifically and preferentially bind to Df31. In addition, MST studies demonstrate that Df31-EGFP interacts with the core histones H3 and H4, but not with H2A and H2B (middle panel). Using reconstituted mono-nucleosomal templates, it could be shown that Df31 also binds to chromatin, which was confirmed by IP (right panel). 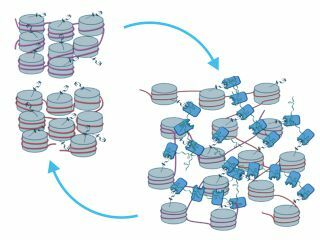 The study demonstrates that our MicroScale Thermophoresis platform is perfectly suited to study epigenetic networks.